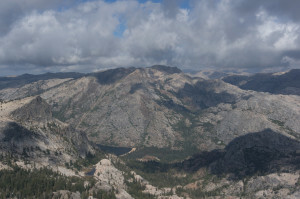 Since it has few high peaks, I have not paid northern Yosemite much attention in the past. However, I was passing by, it was smoke-free, and it contained several remote SPS peaks I had yet to climb, so I decided to go backpacking. 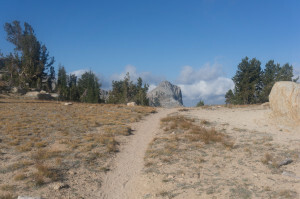 After a couple of years away from the high Sierra, I was reminded of both the pleasure of cross-country backpacking, and the soul-crushing tedium of on-trail travel, which is often merely hours spent walking in a trench full of powdered manure. As most of the route was on-trail and therefore boring, I won’t split out the individual days as I have in the past. After sleeping off highway 395, I rolled into Bridgeport early in the morning, checked my email outside the library, and continued to the permit office south of town. 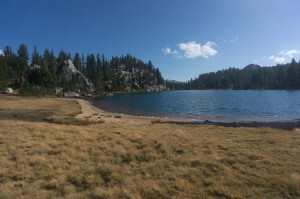 I was expecting to get a permit for the next day, but I was early enough to get a same-day entry permit, so I swung back into town to buy some dry carbohydrates, then drove up to Virginia Lake to assemble my pack. With such luxuries as a down jacket and four cans of Trader Joe’s sardines, four nights’ worth of stuff barely fit in my pack, but I got it all crammed in somehow, had a final meal, and was on the trail a bit after 10:00. 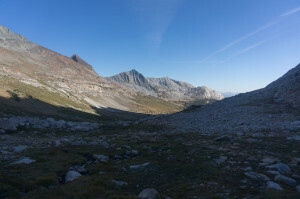 I slogged up to the unnamed pass above Virginia Lake, passing some horse-tourists, then dropped my pack to tag Excelsior, the first peak on my list. One talus-slog later I was on the surprisingly popular summit, looking around at more impressive peaks like Conness and Shepherd Crest. 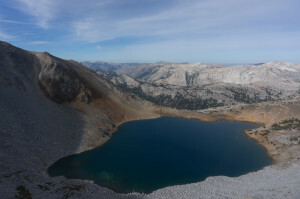 I returned to my pack, then rejoined the trail down to Summit Lake and Pass, where it enters Yosemite and descends into Virginia Canyon. The next two peaks on my list were Volunteer and Pettit, still a couple of canyons over. The obvious trail route descends Virginia Canyon to the PCT, passes over a divide by Miller Lake, then crosses deep and scenic Matterhorn Canyon to Smedberg Lake just north of Volunteer. I cruised down Virginia Canyon, passing a small tent city at the intersection with Spiller Creek, eventually meeting the PCT at one of the day’s low points. 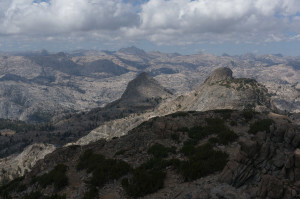 The next section was notably unpleasant, a dusty slog through rolling forest across the divide with Matterhorn Canyon. The highlight is Miller Lake, with a pleasant beach and view to the south. Stopping on the beach for a snack, I got intermittent whiffs of stable smell, and figured there must be a horse camp nearby. I eventually realized that some equestrian jerk had let his horse pee on the beach right next to my obvious sitting-log. Thus encouraged to keep going, I dropped the 1,000 feet into Matterhorn Canyon, then continued a half-mile downstream to a nice camp spot. I spent the first part of the next morning grinding out the climb up the other side of the canyon to Benson Pass. After descending most of the way to Smedberg Lake, I left the trail to climb some grass and slabs to the saddle southeast of Volunteer. I dropped my pack for the short climb to the summit, from which I could see Pettit several bumps away along the ridge to the south. After reading in the register that the traverse was unpleasant, I decided not to attempt it with my overnight pack, but instead to drop down to Rodgers Lake and come at it from the west, picking up Regulation Peak along the way. 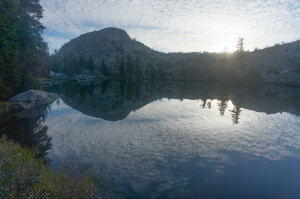 With scattered clouds blocking the sun as I rounded the lake, I felt cold and lethargic. 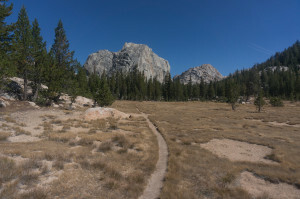 I stopped to cook lunch and read for a while, and almost decided to stop and camp, but eventually roused myself to scramble up Regulation’s west side, a typical northern Yosemite pile of sand and scrub. After climbing a few of the highest-looking rock outcrops on top, and finding no marker or register, I continued across a saddle to Pettit. Descending from Pettit, I made my way along the south shore of Rodgers Lake to my pack, then picked up the trail back north past Volunteer to the PCT. 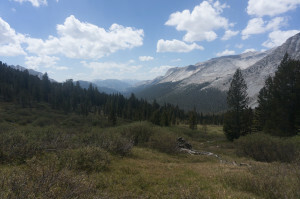 Back in the trench, I made a long descent along a dry streambed to the also-dry Piute Creek, where I met two men section-hiking the PCT between Carson Pass and Yosemite. They seemed to be enjoying themselves on this, one of their last two remaining sections of the trail, though I still can’t see the appeal. I was tempted to stop, but they informed me that there was running water along the trail and nice lakes up toward Seavey Pass. After a quick side-trip to check out the “Benson Riviera,” I continued up the trail, crashing at a flat spot just off the trail near the first lake. Somewhere in this section my stove must have fallen off my pack, so dinner was sardines mashed onto a few tortillas. After spreading out my gear to air out on a rock, I took off with just my camera and an apple for nearby Piute Mountain, another SPS peak. I had no route information, but figured that I could deal with a northern Yosemite peak. 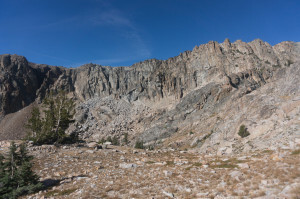 After retreating a bit along the trail, I crossed below another lake, then climbed southwest up a broad, scrubby hillside to a saddle where I could finally see the cliffs of Piute’s east face. Deciding to use a steep chute south of what turned out to be the summit, I crossed a small trees-and-talus bowl to its base. This was taking longer than I had anticipated, and the day was warm, so I was grateful to find a small pool of clear water hidden in the boulders. The chute was a chossy class 3-4 affair, but it got me to the summit plateau, where I followed footprints north to the summit. 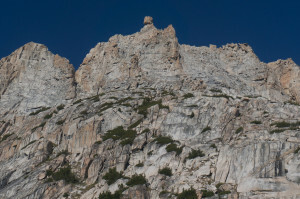 I admired the rolling granite landscape extending north to Tower Peak for a while. While northern Yosemite lacks the domes of Tuolomne, the huge faces of the Valley, and the great peaks of the high Sierra, the rolling, sparsely treed terrain is scenic in its own way. I chose to descend directly northeast from the summit, finding a reasonable third class route back to the saddle, from which I retraced my steps to camp. I was done with my peak-bagging at this point, but was stranded distressingly far from my car. The obvious thing to do would be to retrace my route, but the though of over a full day of trail-slogging through familiar terrain, especially the unpleasant climb out of Matterhorn Canyon, held no appeal. My iPod battery would die partway through, and I would be left with nothing to distract me from the monotony. Instead, I decided to loop north up Rancheria Creek, over Mule and Burro Passes, then (hopefully) shortcut cross-country back to the head of Virginia Canyon. I enjoyed the new territory for a while. 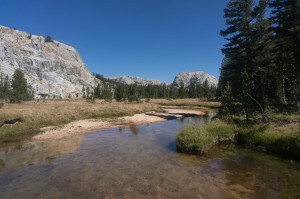 Rancheria Creek is open and flat, with large granite outcrops on either side. I passed a few backpackers headed in from Twin Lakes for the weekend, and a group stopped for lunch at the junction with the Rock Island Pass trail. At this point the day had turned into a slog, so I put on some music for the wooded climb over to Snow Lake. 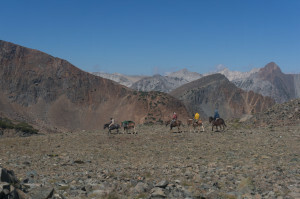 The trail descends northeast to skirt Slide Peak, then turns back southeast to Mule Pass. 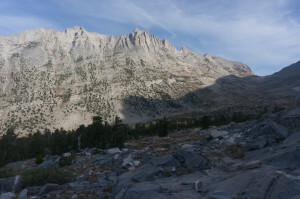 I stopped at the pass to admire Sawtooth Ridge, and to inspect my hoped-for crossing into upper Spiller Creek south of Matterhorn, then dropped into Slide Canyon, joining the path we had used to reach Finger Peaks during the Sierra Challenge. I was tired, but my mood was lifted by the prospect of finally leaving the trail, and by views of the Sawtooth just to the north, especially the huge, balanced summit block of the Doodad. From Burro Pass, the saddle south of Matterhorn looked very doable; hopefully the other side would cooperate. After side-hilling my way around the head of Matterhorn Canyon, I was encouraged and surprised to see a large group descending my intended pass. 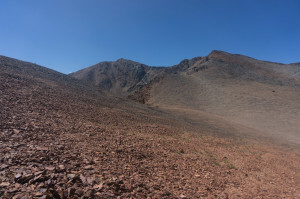 After mining them for beta about getting down the other side, I followed a faint use trail to the ridge, descended a ramp at the north side of the saddle, and started down Spiller Creek. Wanting to make some more miles before dark, I bypassed the lake at the head of the canyon, figuring I would stop by the creek when I was tired. As I should have anticipated in this dry year, the upper creek was dry, but fortunately numerous springs on both sides of the valley were flowing. Around dusk, I found a nicely-made tent platform near the creek almost due east of Whorl Mountain. This is how the Sierra should be: scenic white granite, easy cross-country travel above treeline, and camping wherever you want. 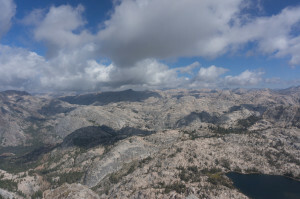 I miss the Cascades’ glaciers and greenery, but they can’t compare to the Sierra for backcountry rambling. The obvious way out from Spiller Creek is to hike down to its junction with Virginia Canyon and pick up the trail from there. However, that involves lots of extra miles and elevation loss. Looking at my topo map, I picked out a route to Spiller Lake, then over the plateau south of Stanton Peak and down to Return Lake. This might involve a similar amount of elevation gain/loss, but with fewer miles and less trail. Other than some ugly talus above Spiller Lake, the route worked well, with an easy side-hilling traverse out of Spiller Canyon to the lake, and easy cross-country travel down to Return Lake. Passing two campers at the lake and a larger group below, I followed the Virginia Pass trail a short distance downstream, then cut the corner between it and the Summit Pass trail, where I rejoined my outgoing route. 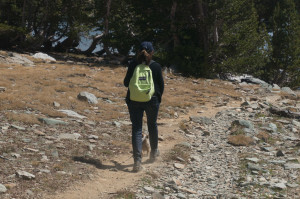 It being Labor Day weekend, the trail was crowded with backpackers and dayhikers. I enjoyed the distraction, especially as I neared the lake and the dayhikers became increasingly ridiculous caricatures of SoCal culture. The winner had to be a woman walking her rat-dog, leash in one hand and Starbucks travel mug in the other, oversized phone poking out of her back pocket. Back at the trailhead, I threw my reeking sardine-trash in the dumpster, rinsed up a bit, and headed south into a pall of horrible smoke pooling in the Owens Valley.